NASA Earth Observatory images by Jesse Allen, using Landsat data from the U.S. Geological Survey. Caption by Laura Rocchio, NASA Landsat Communication and Public Engagement Team. 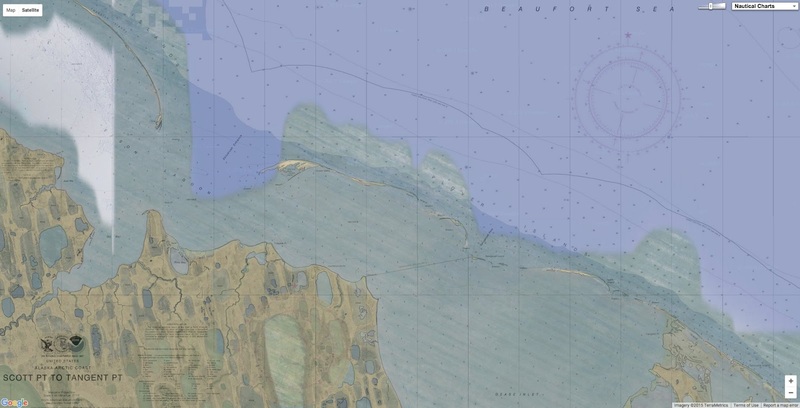 On a recent nautical chart of the Beaufort Sea, in a place where the long, narrow Tapkaluk Islands separate the sea from the shallow Elson Lagoon, a massive underwater shoal appears just west of the entrance to the lagoon. On the chart it looks like a massive blue thumb jutting into the sea from Alaska’s North Slope. The National Oceanic and Atmospheric Administration (NOAA) identified this potential 6-mile-long, 2-mile-wide navigation hazard using Landsat satellite data. 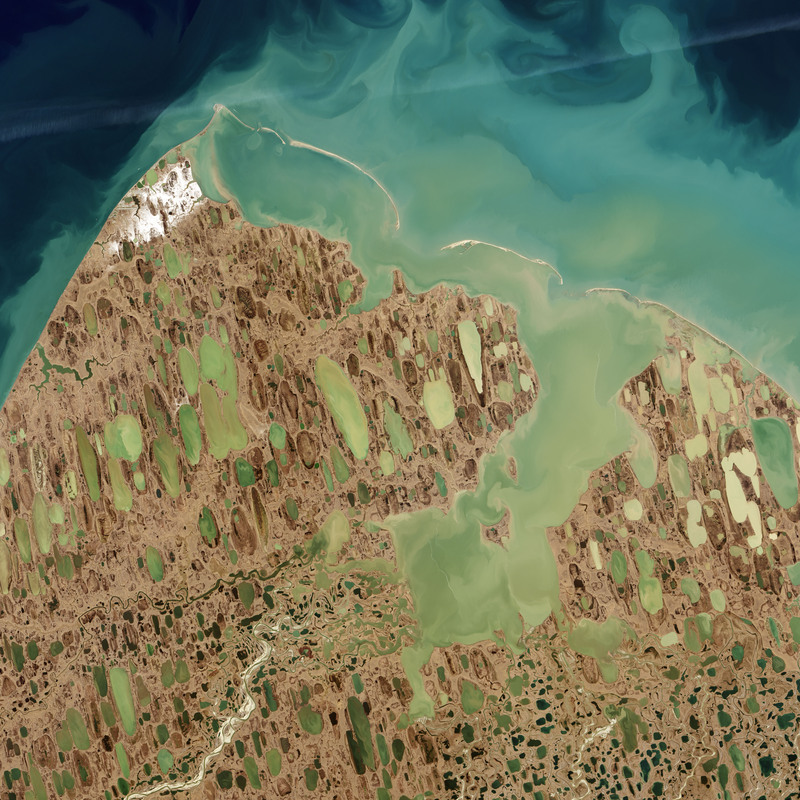 Looking at natural-color Landsat imagery of this area, no shoal jumps out to the naked eye. The image above was acquired by the Operational Land Imager on Landsat 8 on September 6, 2014, and it captures the swirling sediments typical of the North Slope and Elson Lagoon. Those suspended sediments block most of the light that would normally be reflected by the seafloor. Seafloor reflectance is what typically enables researchers to estimate water depth, a technique known as satellite-derived-bathymetry (SDB). In regions like the North Slope—where the waters are turbid and access to hydrographic survey vessels is limited—scientists are developing ways to derive the bathymetry from multiple satellite images taken on different dates. They employ traditional SDB techniques, examining the seafloor reflectance on different dates; they also analyze those images for differences in the swirl of suspended sediment in the water column. From these two approaches, they can detect signs of underwater shoals, gas plumes, or other seafloor formations. The approach is experimental, and it is only used for reconnaissance now. Until a survey vessel is dispatched to the North Slope, the exact depths around this potential shoal cannot be known. But the potential for a large, shallow shoal provoked NOAA to add it to the chart and alert mariners to the potential danger. It was around 1950 that a hydrographic survey ship last took depth measurements in these waters. At the time, surveyors built their maps from a single-beam echo sounder and visual navigation. The data points were laboriously merged with shoreline and hazard information to create a chart. Given the low ship traffic in the region for many years afterward, updating the chart was a low priority compared to other high-traffic areas. Fishing and water-commuting traffic have increased in the area, as has marine tourism. But that’s not all: Bottom depths have changed as currents, erosion, and sediments have sculpted the seafloor. The Marine Chart Division of NOAA’s Office of Coast Survey is responsible for updating more than 1,000 nautical charts that keep mariners safe in U.S. waters. Charged with providing accurate charts, NOAA cartographers need to know when existing charts are out-of-date. They monitor navigation hazard reports submitted by mariners. They watch ship traffic patterns via vessel positioning information (the Automatic Identification System). And more-and-more they are turning to satellite imagery, especially Landsat data. “NOAA is now been using Landsat imagery for chart adequacy assessment and mission planning,” said Shachak Pe’eri, a professor from the Joint Hydrographic Center at the University of New Hampshire. Pe’eri and Lieutenant Anthony Klemm, a NOAA Corps Officer in the Marine Chart Division, have developed new NOAA policies for prioritizing ship-based hydrographic surveys based in part on assessments from satellite-derived-bathymetry. 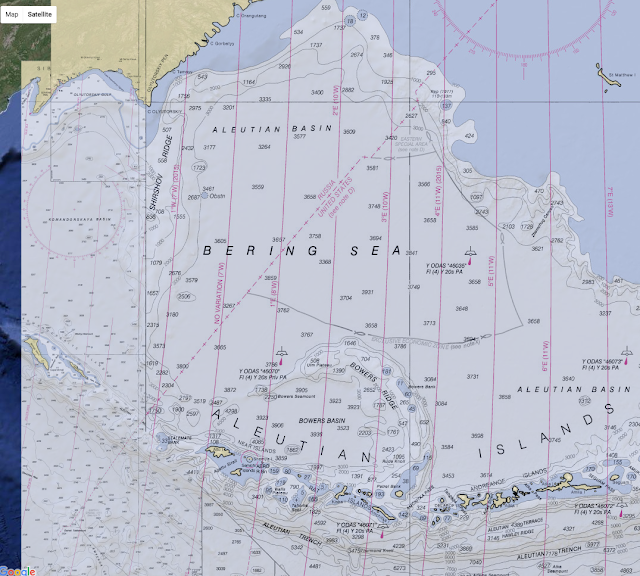 “These charts are considered intermediary, but they can be made publicly available and used until a proper hydrographic survey can be performed,” Pe’eri explains. Such was the case with nautical chart 16081; NOAA is now warning mariners of the massive shoal suggested by the Landsat data. Klemm, A., et al. (2015) “Nautical Chart Adequacy Evaluation using Publicly-Available Data.” Conference Proceedings, US Hydrographic Conference. Chinese navy ships off the coast of Alaska came within 12 nautical miles of the U.S. coast, making a rare foray into U.S. territorial waters. WSJ's Gordon Lubold reports. The US confirmed 5 Chinese vessels recently passed with about 12 NM of the Aleutian islands after a joint military exercise with Russia. The exact location was unclear. The foray, just as President Barack Obama was visiting Alaska, threw a fresh spotlight on China’s expanding naval power and ambitions on the eve of a lavish military parade in Beijing. It also came just three weeks before China’s President, Xi Jinping, begins a state visit to the U.S. already clouded by tensions over alleged cyberattacks on the U.S. and China’s island-building in the South China Sea. The flotilla apparently traveled east from somewhere near Russia and entered the Bering Sea, navigating north of the Aleutian Islands before transiting south, where they undertook the “innocent passage” through U.S. waters between two islands, a defense official said. That principle allows military ships to transit foreign territorial waters if they don’t conduct threatening activity. The Chinese didn’t give prior notification to the U.S. before doing so, but under international law, they don’t need to. The Chinese don’t always acknowledge those laws, however, according to U.S. defense reports. 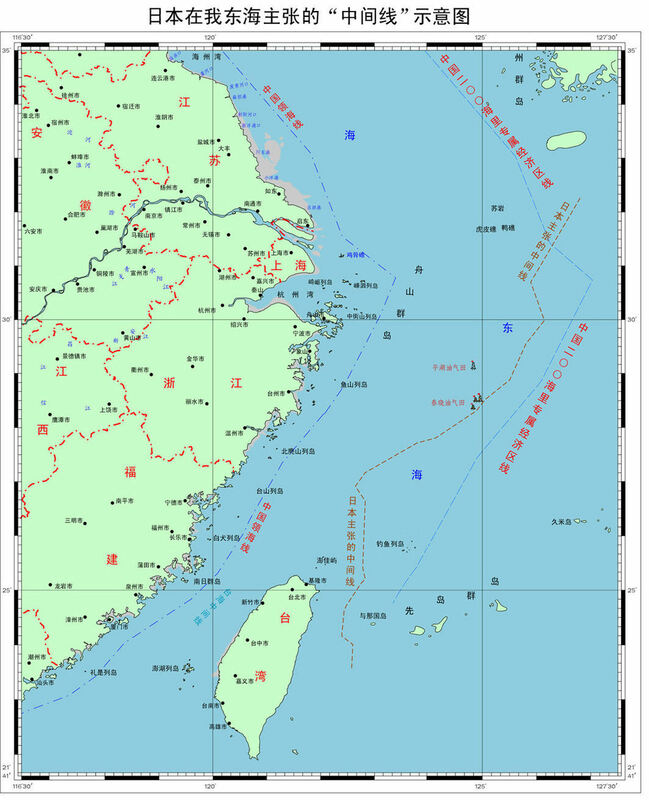 For example, Beijing claims that U.S. warships should request permission before making their own “innocent passage” in Chinese territorial waters. 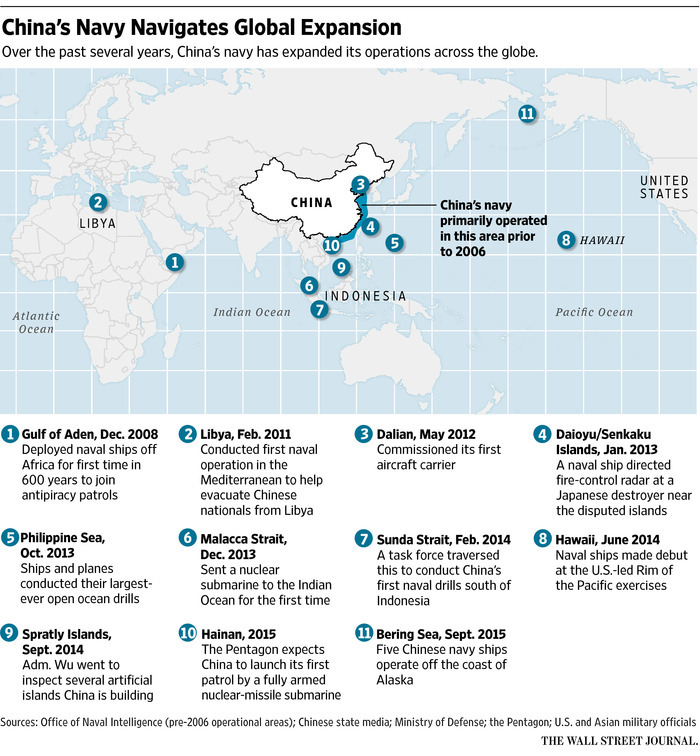 During fiscal years 2012 and 2013, the Pentagon challenged this notion, deploying U.S. naval ships through Chinese territorial waters without notifying Beijing first. According to those reports, the U.S. did not make the same challenge during fiscal 2014. There is no data available for the current fiscal year. U.S. officials believe China is building a “blue-water” navy capable of operating far from its shores, while also developing missiles and other capabilities designed to prevent the U.S. Navy from intervening in a conflict in Asia. Many of those capabilities, including a new antiship ballistic missile, were put on display for the first time on Thursday during the parade to mark the surrender of Japanese forces at the end of World War II. Some U.S. military experts saw the Chinese transit through the Aleutians as a positive step, in that they had adhered to the “innocent passage” principle. “As a matter of fairness and equity, these operations are a big step forward for U.S. interests in that Beijing now has no basis to object to similar passage through China’s territorial sea by the U.S., for instance in vicinity of China’s islands in the South China Sea,” said Peter Dutton, director of the China Maritime Studies Institute at the U.S. Naval War College. China took another step in that direction last year during the U.S.-led Rim of the Pacific, or RIMPAC, joint naval drills in Hawaii. 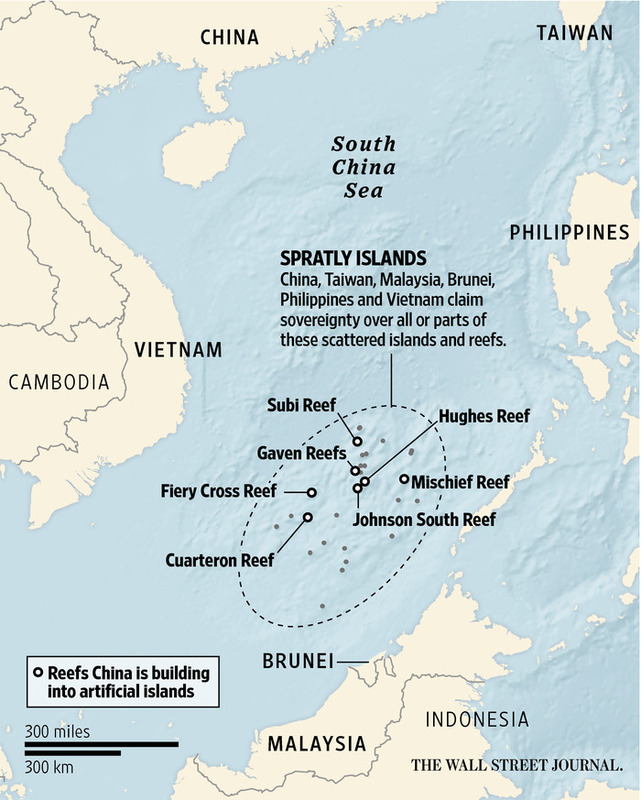 U.S. officials said then that an uninvited Chinese spy ship had observed the drills from international waters. China’s Defense Ministry said that its operations complied with international law. Still, Mr. Dutton and other experts said it was doubtful that China would suddenly stop objecting to U.S. naval ships passing through its waters or conducting surveillance nearby. Pentagon officials said in May they were drawing up plans to send U.S. Navy ships or aircraft within 12 nautical miles of artificial islands that China has been building in the disputed South China Sea. Later that month, China expressed “strong dissatisfaction” and accused the U.S. of irresponsible and dangerous action after a U.S. Navy surveillance jet flew close to the islands, but not within 12 nautical miles. 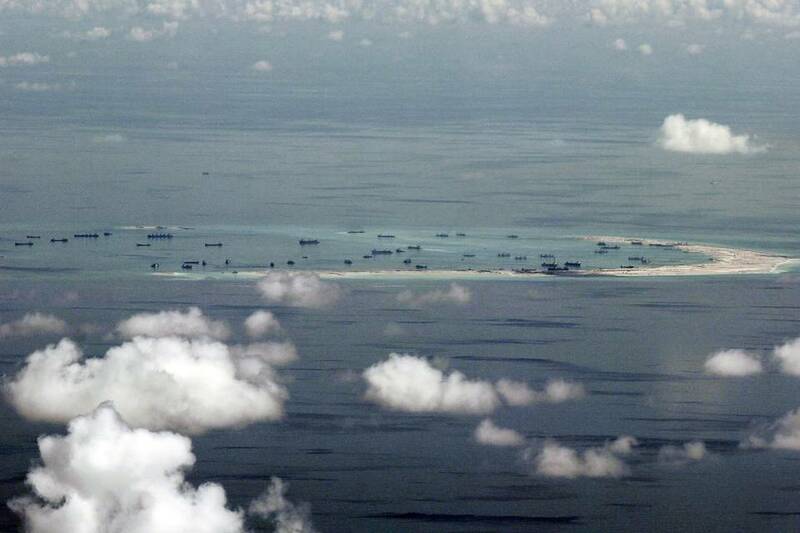 China has also repeatedly demanded that the U.S. cease surveillance operations within its exclusive economic zone, or EEZ, which under international law extends 200 nautical miles from the coast. 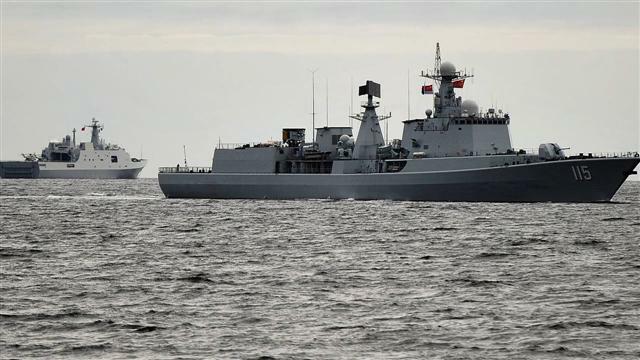 For that reason, Beijing would likely say its ships off Alaska weren't conducting surveillance, although they probably were, said Taylor Fravel, an expert on China’s military at the Massachusetts Institute of Technology. “China faces contradictory impulses to limit the activities of foreign navies within its own EEZ and to operate within the EEZs of others,” he said. China’s Defense Ministry didn’t respond to questions about which ships were in the flotilla near Alaska or how close they came to U.S. territory. The joint exercises with Russia ran from Aug. 20-28 off the Russian Pacific coast—about 2,000 miles west of the Bering Sea—according to the official Xinhua News Agency. Seven Chinese ships took part, including two destroyers, two frigates, two landing ships and one supply ship, Xinhua said. U.S. officials said the five ships near the Aleutians included three Chinese combat ships, a supply vessel and an amphibious landing ship. Yellowtail and albacore tuna are becoming increasingly rare, as well as bluefin. Tuna and mackerel populations have suffered a “catastrophic” decline of nearly three quarters in the last 40% years, according to new research. Ohoidertutu Village, Kei Islands, Moluccas, Indonesia. Attention in recent years has focused on species such as bluefin tuna, now on the verge of extinction, but other close relatives commonly found on restaurant menus or in tins, such as yellowtail tuna and albacore, are now also becoming increasingly scarce. 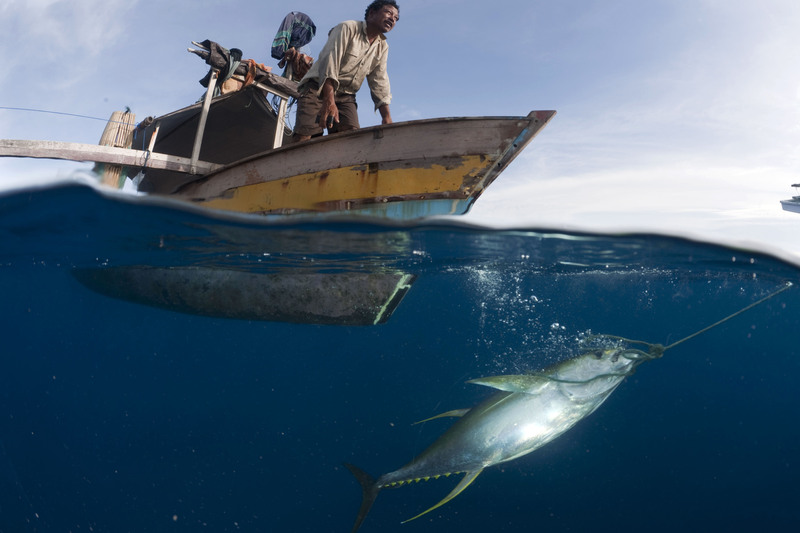 Only skipjack, also often tinned, is showing “a surprising degree of resilience”, according to Heaps, one of the authors of the Living Blue Planet report, published on Wednesday. Sea cucumbers, a luxury food in Asia, have fallen 98%. Other species suffering major declines include sea cucumbers, a luxury food in Asia, which have fallen 98% in number in the Galapagos and 94% in in the Egyptian Red Sea. Populations of endangered leatherback turtles, which can be seen in UK waters, have plummeted. 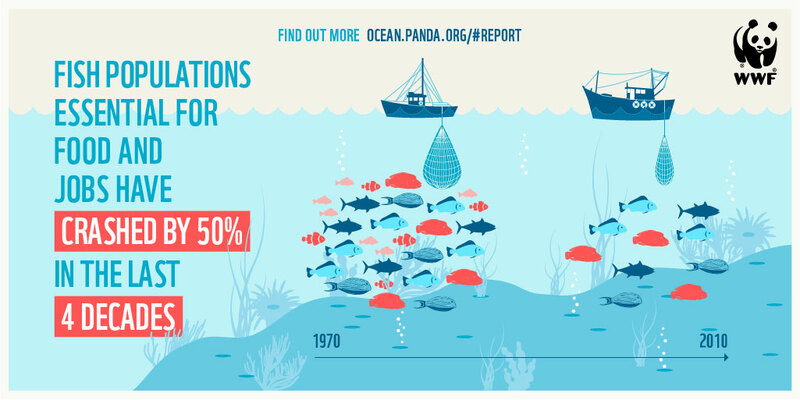 Overfishing is not the only culprit behind a halving of marine species since 1970. Pollution, including plastic detritus which can build up in the digestive systems of fish; the loss of key habitats such as coastal mangrove swamps; and climate change are also taking a heavy toll, with the oceans becoming more acidic as a result of the carbon dioxide we are pouring into the atmosphere. “I am terrified about acidification,” Heaps told the Guardian. However, Heaps said there were solutions. Overfishing can be managed with better governance – Heaps points to the recovery in North Sea cod stocks as an example of how management can work. She also urged governments to adopt the sustainable development goals, proposed by the United Nations and including provisions for protecting marine life, at the UN general assembly later this month. A silvertip shark swimming in Beqa lagoon, near Suva, the capital of Fiji. Heaps urged people only to eat fish certified as sustainable by the Marine Stewardship Council (MSC), which examines fisheries against a range of criteria to ensure that they are being properly managed. An increasing number of fisheries have been accredited by the MSC, and at present about half of global white fish stocks are certified, including many in the North Sea. She called for more partnerships between private sector fishing fleets and governments, in order to conserve stocks. “We need to keep [fishermen] on board, because they must see that good governance is in their interests,” she said. European Union nations on Monday approved proposals for military action against people smugglers who helped refugees cross the Mediterranean, authorizing a plan that called for the seizure and destruction of boats to break up smuggling networks operating out of Libya. The E.U. had launched a naval mission in July that conducted intelligence gathering, but the new ruling makes it legal to stop and, if necessary, destroy boats which are found to be involved in people trafficking. "The conditions have been met," an unnamed European diplomat told Agence France-Presse. thousands of others have died trying. However, the second phase of the operation limits authorization for E.U. naval activities to international waters. The third phase would involve military action against people smugglers inside Libyan territorial waters. The third phase would require authorization from the U.N. Security Council and preferably an agreement with the Libyan government. Russia, current president of the Security Council, has said that a resolution authorizing military activity in international waters could be adopted this month. An internal document on the proposed military action warned that "non-compliant boarding operations against smugglers in the presence of migrants has a high risk of collateral damage including the loss of life,” EUObserver reported. The decision comes as E.U. nations struggle to deal with a massive influx of refugees fleeing conflict in the Middle East and Africa. E.U. interior ministers are set to meet later in the day to agree on quotas for redistributing refugees among member countries, a proposal that several nations have strongly condemned. Slovakia, the Czech Republic, Hungary and other nations have boosted security along their border, taken steps to keep refugees out or move them into other countries, or expressed their intent to object to the quota plan. European Union officials authorized a plan to take naval action against people smugglers bringing thousands of refugees across the Mediterranean. In this photo, a Syrian refugee holding a baby in a lifetube swims towards the shore after their dinghy deflated some 100m away before reaching the Greek island of Lesbos, on Sept 13, 2015. The International Organization of Migration said last week that an unprecedented number of migrants have made the risky crossing across the Mediterranean by boat so far in 2015. The agency reported 432,761 had reached Europe by sea this year, more than double the number of the year before. Nearly 3,000 have lost their lives in the passage. E.U.-led efforts to help broker a national unity government in Libya have not borne fruit, but special U.N. envoy Bernardino Leon said Sunday that progress was being made. Calving ice near Paradise Harbor in Antarctica in Jan. 2015. The continent's ice sheet and the rest of the world's land ice would melt if all the world's fossil fuels were burned, a new climate study found. Seas could rise as fast as three centimeters a year if fossil fuel consumption continues at its present rate. Such increases would amount to ten times the current rise of roughly three millimeters annually. But Antarctica's vast ice sheets may substantially melt and accelerate the rise of seawaters should the burning of fossil fuel continue unabated, according to new computer simulations of climate change’s future impact. Scientists had previously thought that East Antarctica's massive ice sheets were relatively safe, requiring thousands of years to pass before warming global temperatures would begin to melt them. Unchecked fossil fuel use will see the larger east Antarctic ice sheet melt, as well as the west one, causing devastating sea level rise, say scientists. But the new simulations, published in Science Advances on September 11, suggest Antarctica's ice is much more vulnerable—and thus sea level rise could be a lot worse. "Humanity can indeed melt all of Antarctica's ice, if we were to burn all of the fossil fuels," says Ricarda Winkelmann, a physicist by training who now works on computer models at the Potsdam Institute for Climate Impact Research. "What we do today by emitting greenhouse gases within just a few decades triggers changes that will be felt by many, many generations to come." A trip to Antarctica inspired Winkelmann’s interest in the longevity of the ice on the iciest continent as carbon dioxide continues to accumulate in the atmosphere. "It was really impressive to personally see the ice—its incredible beauty and its sheer mass," she recalls of her time on the research vessel Polarstern. 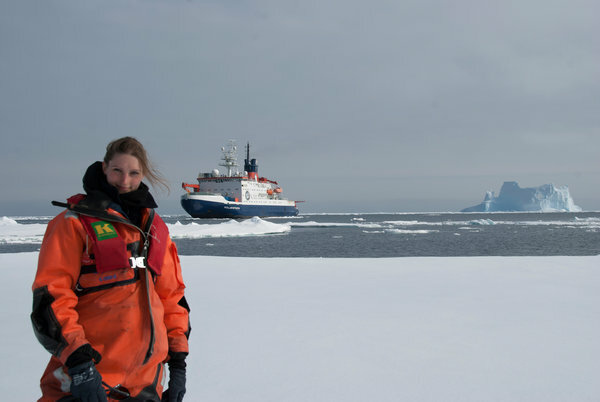 Ricarda Winkelmann of the Potsdam Institute for Climate Impact Research in Antarctica. "If we burn it all, we melt it all," she said. To explore the long-term implications of global warming for Antarctica, Winkelmann teamed up with climate scientist Ken Caldeira of the Carnegie Institution for Science at Stanford University, who attributes his interest in climate science in part to a 1979 New York Times article warning of "widespread floods" caused by the loss of South Pole ice. Using a computer model developed by Andy Ridgwell of the University of Bristol that simulates how the atmosphere and ocean respond to increasing levels of greenhouse gases, the team fed rising temperatures from various amounts of total pollution into an ice sheet model developed by Anders Levermann of Potsdam University. The simulation suggests how ice will flow and dwindle as it melts in response to temperature changes in the atmosphere and ocean, whether increased snowfall as a result of warming or the additional melting as a glacier loses height. The researchers modeled carbon increases ranging from an additional 93 gigatons (representing another decade of fossil fuel consumption at the present rate) to as much as 12,000 gigatons (the total amount of carbon available from already discovered and recoverable deposits of coal, oil and natural gas) over the next few centuries. A gigaton is equal to a billion metric tons of carbon, and current fossil fuel burning results in about 10 billion metric tons of carbon—10 gigatons—entering the atmosphere each year. The simulations suggest that if another 500 gigatons of carbon end up in the atmosphere—an amount that would require a transition off fossil fuels by the end of this century—seas would rise by more than a meter within a thousand years. In the worst-case scenario, wherein all the fossil fuels are burned over the next few centuries, the seas could rise as fast as three meters per century, and as much as 50 meters within 10,000 years—equivalent to the height of more than 50 Niagara Falls. Not only is that unprecedented in the 10,000-odd years that human civilization has flourished, but it would doom coastal cities such as New York, Hamburg, Lagos, Shanghai, Sydney and Rio de Janeiro, where more than a billion people currently live. "Each ten gigatons of carbon leads to more or less three centimeters of sea level rise in 1,000 years," Caldeira notes. during an Operation IceBridge research flight. Like their human counterparts on coasts around the world, the inhabitants of Antarctica—seabirds, penguins and seals among them—would lose the ice that provides their only home. While some of these animals might find homes in zoos, the majority of ice-dependent species would face potential extinction in the wild in the next millennium. And speculative techniques to preserve the ice, such as lacing the stratosphere with sulfuric acid to mimic the cooling effect of a volcano, most likely will not help. 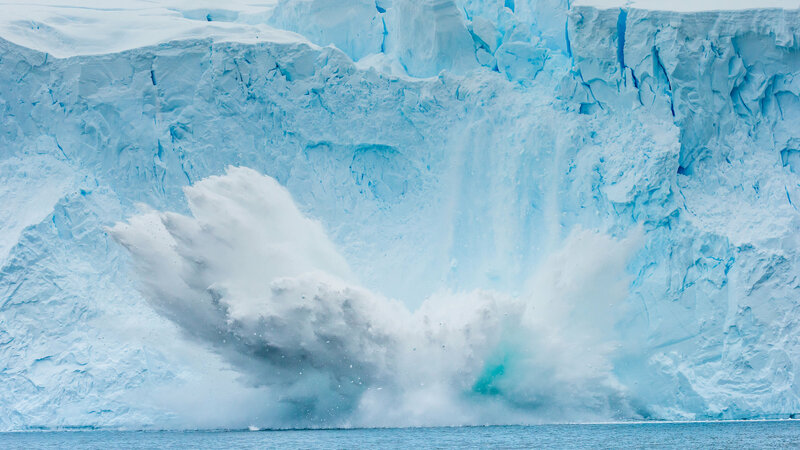 "Ice sheets, once they go, are hard to get back," says Caldeira, who has also studied such climate interventions, sometimes called geoengineering. It could already be too late to save portions of the ice in West Antarctica. Recent research suggests that the ice sheets of the Amundsen Basin may have passed the point of no return as warmer ocean waters slip up under the vast glaciers. Thus, even if no more excess carbon dioxide were to build up in the atmosphere, that ice would continue to melt. As a result of that meltdown, along with the dwindling of Greenland's ice sheet and mountain glaciers and the expansion of warming seawater, rising sea levels—fast or slow—will be with us for millennia to come. 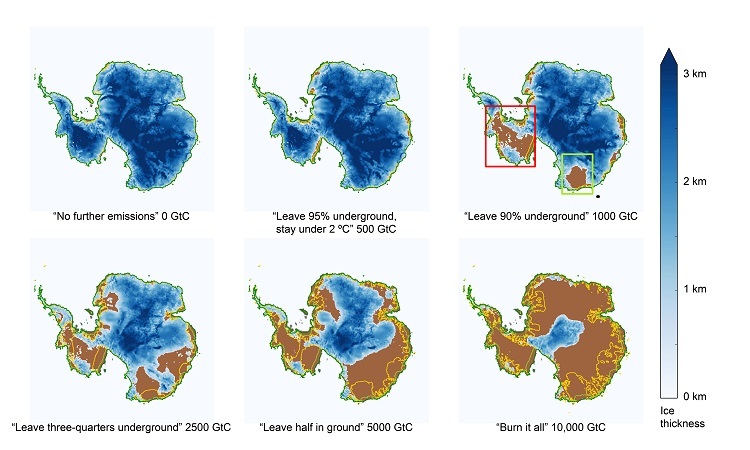 The simulation further revealed that if more than one trillion metric tons of carbon are dumped into the atmosphere, East Antarctica could face the same fate. "What I was startled by was the speed at which the East Antarctic ice sheet could melt," Caldeira says. 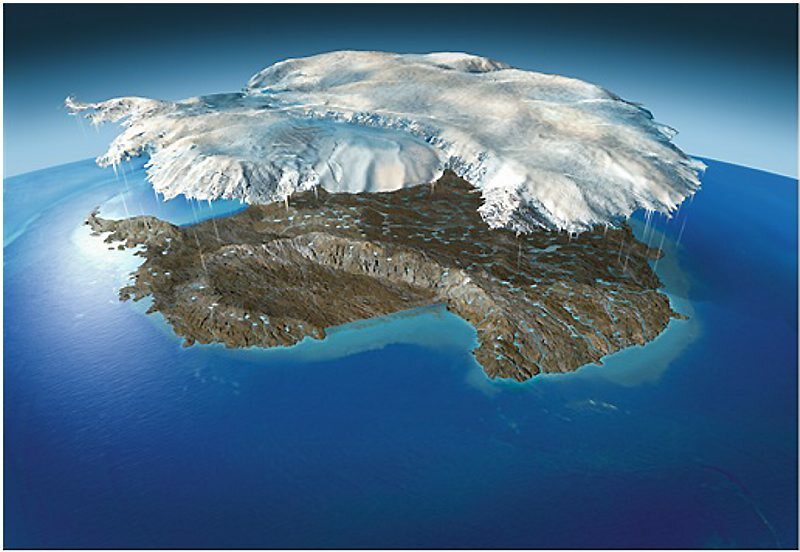 "It took around 10,000 years for the big northern hemisphere ice sheet to melt at the end of the last ice age, so I assumed it would take 10,000 years to get substantial melt out of East Antarctica." Instead, extensive melting could take place within 200 years, depending on how much carbon is ultimately emitted. However, if temperature increases can be held to no more than 2 degrees Celsius—roughly equivalent to another 500 gigatons of carbon, or one trillion metric tons in total—then sea level rise could top out at about two meters. How these scenarios play out in the future will be profoundly affected by concrete regional infrastructure choices being made today. The decision of which type of power plant to build today in Florida, for instance, could determine whether the majority of the state disappears underwater in a matter of centuries. "Avoiding emissions is really the only practical path," Caldeira says. By Mapping Specialists.Originally produced for "The Unquiet Ice,"
by Robin E. Bell, in Scientific American, February 2008. The simulations have practical implications for billions of coastal residents as well. If the seas rise only slightly this century, one effective form of adaptation would be to build seawalls. However, should sea levels swell at a rate of three centimeters a year, no seawall will suffice and coastal retreat becomes the more viable option. An unstoppable meltdown could be in store for Antarctica's ice—and all of the other ice sheets around the globe—unless people stop dumping CO2 in the atmosphere like a sewer. Carbon dioxide, once emitted, can remain in the atmosphere for thousands of years, trapping extra heat like a smothering blanket. "It is much easier to know that an ice cube in a warming room is going to melt eventually than it is to say precisely how quickly it will vanish," Winkelmann says. "I certainly hope that mankind will not choose to burn all fossil fuels, simply because I know how enormous the consequences will be." National Geographic : Just How Much Could the Sea Rise from Burning Fossil Fuels? A Lot.